India with 1,270,272,105 people (1.27 billion) is the second most populous country in the world. The figures show that India represents almost 17.31% of the world’s population, which means one out of six people on this planet, live in India. Although, the crown of the world’s most populous country is on China’s head for decades, India is all set to take the numero uno position by 2030. With the population growth rate at 1.58%, India is predicted to have more than 1.53 billion people by the end of 2030. India’s total gross area of 3, 287, 260 square km and total cropped area is about 192.2 million hectares and the net sown area is 140 million hectare. Due to limited natural resources, limited land area, water and a vast majority of poor, uneducated and underutilized human resources, our cities are becoming increasingly un-sustainable. Peri-urban cultivation of vegetables is one of the solutions to convert urban poor to being employed while at the same time improving the built environment. There are hundreds of cities both in rich and poor countries that have set targets to make their cities green and sustainable cities. The cost of greening and cleaning can be borne by urban food production and urban agriculture. Different countries in the world like China, Australia, USA, South America, Europe and many Asian as well as African countries are doing it and constantly improving on this. In India, though the concept of peri-urban agriculture is beginning to become popular. Cultivation of vegetables in peri-urban or urban areas is recognized for its potential role in increasing food security, employment and income generation, poverty alleviation, community resource development, waste management and environmental sustainability. A large part of the world population is living in peri-urban areas. The rich social and economic variability of peri-urban areas offers opportunities for innovative science, living condition improvement and agricultural and ecosystem management requiring novel policies, and action to promote harmony both between society and nature and between groups of people. Peri-urban agriculture as defined in the introduction can be subdivided in intra-urban and peri-urban agriculture. Intra-urban agriculture takes place within the inner city. Most cities and towns have vacant and under-utilized land areas that are or can be used for peri-urban agriculture, including areas not suited for building (along streams, close to airports, etc. ), public or private land not being used (land waiting for construction) that can have an interim use, community lands and household areas and peri-urban agriculture takes place in the urban periphery. Availability of rail, road and air transport, cold storage, processing units, export houses and well established market network, will be helpful for taking up vegetable cultivation in peri-urban areas of metro cities in an organized way. Also, a huge quantity of solid waste generated during handling and marketing of fresh vegetable produce in metro cities, which is creating health and environmental hazards, can be used or recycled to produce vermicompost, etc., for use in organic vegetable production. Peri-urban vegetable cultivation can provide farmers the possibility to cultivate a small piece of land, and obtain an income to meet their essential and basic needs. In recent years, around big cities, green belts are being developed which can provide a very intensive and profitable network of small farms specialized in production of perishable vegetables for consumption by the urban consumers. This is likely to result in a social symbiosis between farmers and city dwellers with mutual benefits and advantages. This will require involvement of a large number of institutions to address many issues related to the peri-urban vegetable cultivation in a viable participatory approach to make an impact and deliver anticipated results to the peri-urban population. Due to high levels of unemployment in cities, many families depend on growing their own produce, especially vegetables, on small plots for home consumption and for sale. Poorer families spend a larger proportion of their income on food. Thus the ability to grow their own vegetables contributes significantly to household food and income security. Nutrition security is enhanced as well; vegetables diversify diets and, more importantly, are a source of micronutrients, vitamins and minerals vital for good health (Table-2). Many research institutes and agriculture universities of India develop and promote a range of vegetables, from tomato to traditional leafy crops, which can be grown in urban and peri-urban environments. Simple, low-cost methods to handle these valuable crops after the harvest can help urban and peri-urban vegetable growers reduce post-harvest losses and provide more and better quality vegetables at home and to local markets. Vegetable quality needs to be maintained from the moment of harvest. Even when the distance from the farm gate to the consumer is relatively short, as in urban and often in peri-urban horticulture, growers must take care when harvesting, storing, packing and transporting fresh produce to prevent damage and maintain quality. Water quality is another concern for vegetable production in urban settings. The source of water used to produce and clean the crop may be polluted by industrial and domestic waste. If pesticides are used on crops, pesticide residue may contaminate produce, and the local water supply, if producers are not adequately trained and willing to follow proper use of the chemicals. 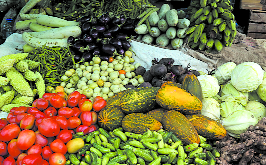 Growers should avoid using polluted water to wash vegetables after harvest to prevent contamination from microorganisms, pesticide residues and heavy metals harmful to human health. Urban producers need a good understanding of the risks of using contaminated water. Table 1. Top three states on the basis of urban population. The first step to deliver a good quality crop to the market is to harvest at the optimum stage of maturity. Leafy vegetables should be harvested when they reach full size and before they start losing color and becoming fibrous. Tomato is ready to harvest when its fruit is physiologically mature – that is, when the pink or red color first becomes noticeable on the fruit. Vegetables destined for the market should be graded to remove damaged or diseased material (which will also reduce spoilage) and packed into uniform lots so that they are attractive to consumers and fetch a higher price. A simple way to reduce post-harvest losses is to harvest before temperatures are high, such as in the early morning or late afternoon, and to keep produce in the shade once it has been harvested. Leafy vegetables kept in the shade will maintain their quality longer than those exposed to full sun. Ice can reduce the temperature of harvested vegetables. Covering produce with a moist material, such as damp sacking or straw (taking care to keep the vegetables dry), is also effective in reducing the temperature by taking advantage of evaporative cooling principles. Another simple technique is to use good-quality packaging that will protect the crop after harvest. Many growers put their newly harvested leafy greens in large polyethylene bags; during transport the leaves may be bruised or crushed. Bamboo baskets are not suitable for packing soft fruit vegetables such as tomato because the rough surface may damage the produce. Rigid containers with smooth surfaces reduce crushing, bruising and damage. Training urban growers in proper handling methods and disseminating information to show the economic benefits of good post-harvest handling can help ensure that more vegetables of better quality reach the market. Recommended techniques and technologies should not be time-consuming to apply or expensive, as the lack of capital is often a major barrier to adoption. Improved post-harvest handling results in a higher quality product which is more nutritious and should fetch a higher price – an important incentive for growers to adopt these techniques. Table 2. Nutritional value of some vegetable crops (100 g). Vegetables are particularly well-suited to peri-urban farming because only a small land area is needed to produce an ample crop. For example, a home garden model developed by agriculture universities for a 6 m x 6 m plot can produce approximately 250 to 500 kilograms of fresh vegetables per year. Vegetables produced from home garden model can supply a family of four to six with 200 g of vegetables per person per day. Various types of peri-urban locations can be chosen like; community gardens (formal and informal), home gardens, institutional gardens (managed by schools, hospitals, prisons, factories), nurseries, roof top gardening, cultivation in cellars and barns (e.g. mushrooms, earthworms). Research data seem to indicate that intra-urban agriculture tends to be more small-scale and more subsistence-oriented than peri-urban agriculture, although exceptions can regularly be found (e.g. vegetable production and production of mushroom or ornamental plants). Many vegetable crops can be harvested within a short time from planting. Spinach, Tomato, Cucurbits, Chilli and Amaranths are ready to harvest in 30-50 days, and can be harvested up to ten times per crop cycle, providing a steady supply of fresh greens during the growing season. Vegetables such as spinach, amaranth and sweet potato leaves are rich in nutrients, often surpassing more familiar crops such as cabbage in nutritional quality (Table-2). Vegetable production in urban and peri-urban settings means that the distance from the field to the consumer is much shorter. Home gardeners have fresh vegetables at their doorstep, and small-scale urban growers who sell their crops have the advantage of lower transportation costs. These growers may not have to deal with middlemen or brokers as rural farmers usually do, and thus are able to respond quickly to price fluctuations. The most important distinguishing character of peri-urban cultivation of vegetables is not so much its location, but the fact that it is an integral part of the urban economic, social and ecological system. It uses urban resources (land, labour, urban organic wastes and water); produces for urban citizens; is strongly influenced by the urban conditions (policies, competition for land, urban markets and prices); and impacts on the urban system (effects on urban food security and poverty, ecological and health impacts). Although some forms of peri-urban cultivation are based on temporal use of vacant lands thus an important component for sustainable city development. Rapid urbanization is taking place in most developing countries. Increase in urban poverty, food insecurity and malnutrition, with a shift in their concentration from rural to urban areas is accompanying urbanization. Many cities cannot cope with the massive growth of its population, which leads to a decrease in urban shelter and security of tenure, backlogs in delivery of basic services, increasing inequality and segregation, degradation of the urban environment and increase in poverty, malnutrition and food insecurity. Longer-term peri-urban cultivation of vegetables seems to be sustainable; especially when it has potential for multi-functional land use is recognized and fully developed. This multi-functionality of peri-urban cultivation makes it a cheap producer of public goods. Sustainability of urban agriculture seems strongly related to its contribution to the development of a sustainable city – i.e. one that is inclusive, food-secure, productive, and environmentally healthy.